Wolf Website Designer is a native Mac application that makes it simple to design and publish professional, mobile-friendly, websites. The perfect solution for web design without coding, Wolf is a drag and drop designer that takes care of integration with mobile frameworks, HTML5 code generations and secure website publishing. 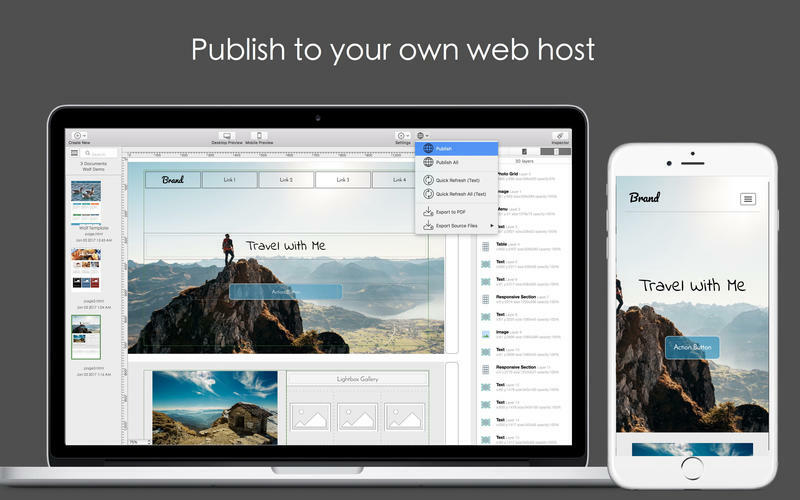 Using Wolf, your website is published directly to your own web host. You own all the code generated from the web design. In addition to the built-in secure FTP upload options, Wolf also allows you to export all source files, so you can directly edit and use the raw design files anyway you wish. + Brought to you by the team behind the Orion Mac Suite, Wolf's editor interface is designed with key focuses on simplicity and ease of use. 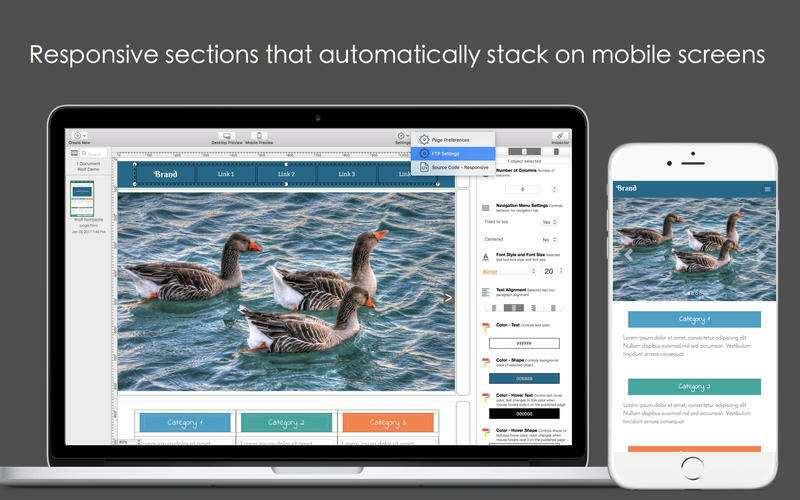 Drag and drop to add objects to your design, click and drag to resize and manage layout. + Zero coding: We think web design should be simple and fun, so anyone can build beautiful websites without needing to learn or understand how to code. + Responsive and mobile friendly: Integrated with the powerful Bootstrap Framework, your website will look amazing on desktop, tablets and mobile devices. + Shared website header and footer: Easily build and maintain a consistent theme for the entire website using Wolf's exclusive Shared Header and Footer feature. + Support for FTP: Upload to your own web host. Supports FTP, SFTP and FTP/SSL. + Professional templates:  Beautiful templates allows you to get a jump start on your web design. + Standalone software: Unlike many other web design solutions that are based on monthly subscriptions, Wolf is a true standalone software. No subscription fees, just a straight forward, one time purchase. 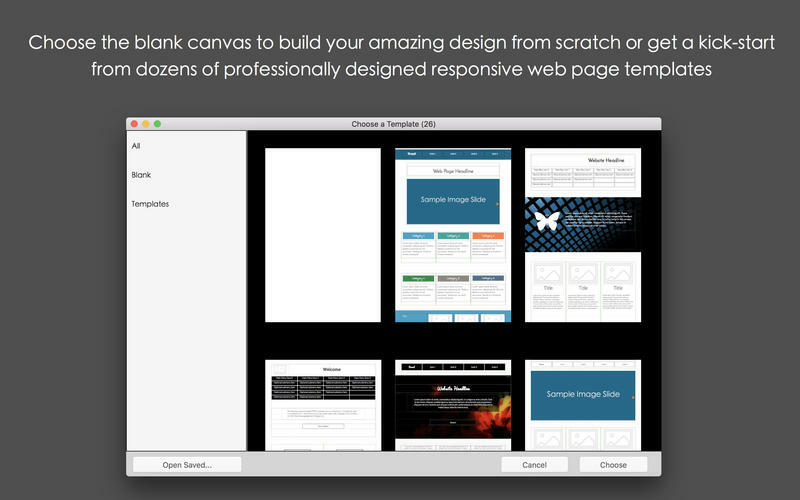 + Unlimited websites: Build as many websites as you like. 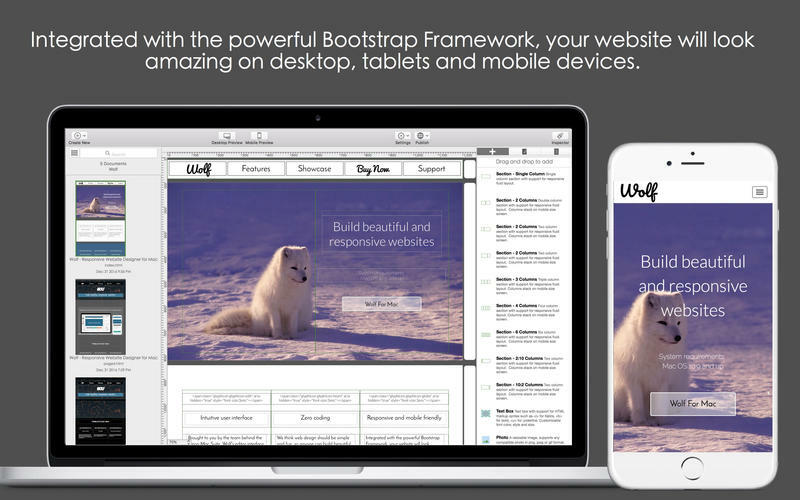 Unlike subscription based services that often restrict users to a single website, Wolf is a full fledged desktop software that allows you to build as many websites as you like. You may choose to publish to your own web host, or save and export your design and source code. + Beautiful web fonts: Beautiful web fonts is key to a building a successful website. Wolf provides you with a wide selection of gorgeous web fonts, so you can format and style with ease. + Carousel: Add more interactivity to your website with amazing, full screen width, image and text carousels. + Galleries:  Gorgeous lightbox galleries. Display your photos in a lightbox when they are clicked. + HTML Snippets:  You're never limited to the drag and drop interface. Easily add code snippets to achieve custom effects and special plug-ins. You are invited to come and browse our gallery of websites created using Wolf.